Conrod/Conrad Bovey/Povey was born about 1714. Conrod/Conrad Bovey/Povey married Mary Magdalene (Unknown). Mary Magdalene Bovey Abt. 1735 Abt. 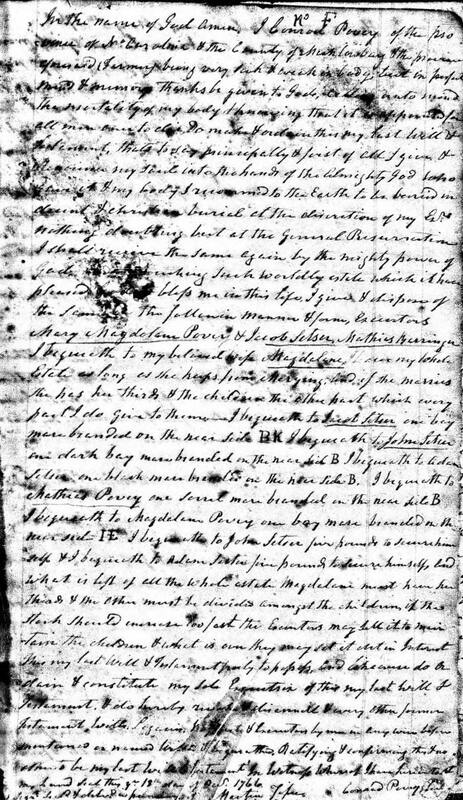 1795 Jacob Setzer, Sr.
Conrad died about 1755 in Lincoln/Catawba County, North Carolina. In the name of God. Amen. I, Conrod Povey, of the province of No. Carolina & the county of Mecklenburg & the province aforesaid (farmer) being very sick & weak in body but in perfect mind & memory. Thanks be given to God. Calling unto mind the mortality of my body & knowing that it is appointed for all men once to die, Do make & ordain this my last will & testament. That's to say principally & first of all I give & renounce my soul into the hands of the Almighty God who gave it & my body I recommend to the earth to be buried in decent & Christian burial. At the discretion of my heirs nothing doubting but at the general resurrection I shall receive the same again by the mighty power of God and touching such worldly estate which it have pleased God to bless me in this life, I give & dispose of the same in the following manner & form. Executors Mary Magdalene Povey & Jacob Setser, Mathias Barringer. I bequeth to my beloved wife, Magdelene, I give my whole estate as long as she keeps from merying and if she merries she has her third & the children the other part which every part I do give to them. I bequeth to Jacob Setser one bay mare branded on the near side "B.K." I bequeth to John Setzer one dark bay mare branded on the near side "B". I bequeth to Adam Setser one black mare branded on the near side "B". I bequeth to Mathias Povey one sorrel mare branded on the near side "B". I bequeth to Magdelene Povey one bay mare branded on the rear side "I.E." I bequeth to John Setser five pounds to secure himself land & I bequeth to Adam Setser five pounds to secure himself land, and what is left of the whole estate Magdelen must have her third & the other must divide amongst the children. If the stock should increase too fast, the executors may sell it to maintain th children & what is over they may let it out in interest. This my last will & testament freely to and likewise do ordain & constitute my soule executrix of this my last will & testament & do hereby revoke & disannul & every other former testament, wills, legacies, bargins to, & intention by me in any wise before mentioned as named willed & bequethed ratifying & confirming this & no other to by my last will & testament, in witness whereof I have hereunto set my hand seal this yr. 18th day of Dec. 1766.